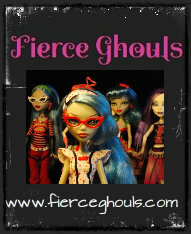 Monster High costumes, wigs & makeup for kids AND grown-ups! Choose a banner or button, right click and save. If you have a Monster High Doll/Dollhouse or any 1:6 Scale/Playscale Doll or Dollhouse related website, online photo album, YouTube Channel or blog, fill in the form below to have your link added!